Accel's compression and injection molding equipment produces the finest caps and rotors. The distributor caps are stress-relieved immediately after molding to ensure dimensional stability. Highly-conductive, corrosion-resistant brass inserts and stainless steel rotor springs provide unrestricted spark energy flow. High-performance 60kV-rated tan alkyd molding compound is used for superior protection from arc through and crossfire (mineral-filled polyester is used for late model Ford and GM parts). 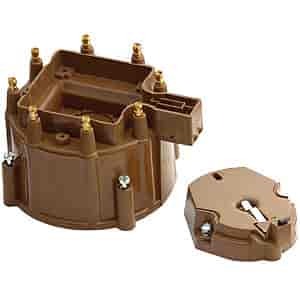 Heavy-duty black alkyd caps and rotors are also available as lower cost alternatives. Click on More Info links below for year/make/model. Does Accel 8122 fit your vehicle?